Today I'm pleased to be welcoming a new author to the blog. 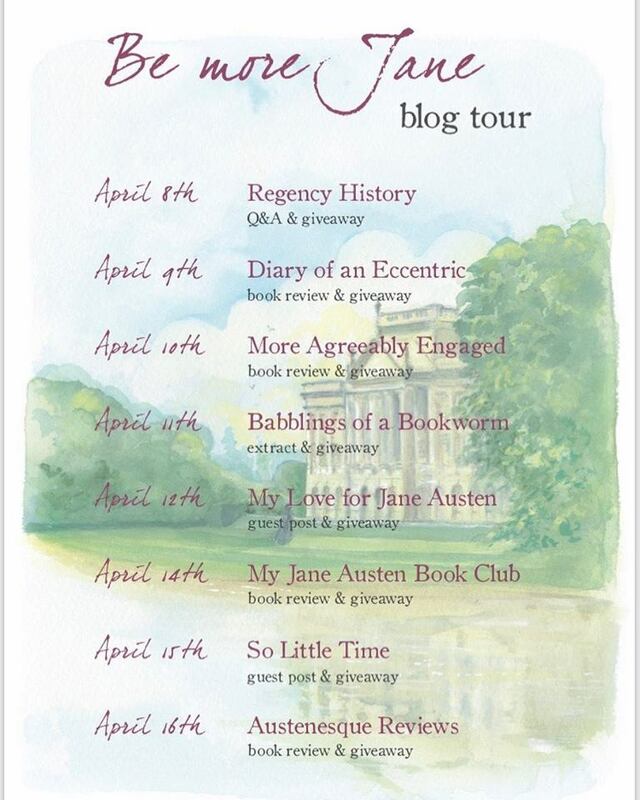 Although Be More Jane is Sophie Andrews' first book, many of you will be aware of her, as a blogger over at Laughing With Lizzie, and the creator of the Laughing with Lizzie Facebook page. Sophie is a very keen Janeite and she has created a gorgeous book, with illustrations from the very talented Jane Odiwe, who is a wonderful artist in addition to being a talented author. Let's have a look at the blurb to get a flavour of what Sophie's book is about, and then I will hand over to her for a guest post, excerpt, and a chance for you to win a copy of the book! Are you more Marianne than Elinor, Lydia rather than Lizzy? Be More Jane will teach you to address life with more sense and less prejudice, taking useful lessons from the novels and letters of Jane Austen, one of the world’s best-loved writers. Times may change, but many of our problems remain the same. 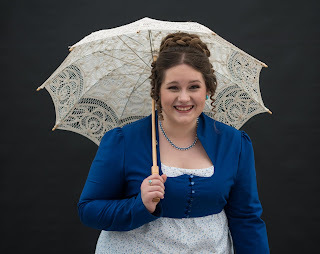 Sophie Andrews, a young Janeite, knows from personal experience that in times of trouble, or just on matters of friendship, family, and love, answers are to be found in the pages of Miss Austen’s novels. Thank you so much, Ceri, for welcoming me to your blog. I am excited to be sharing an extract from my new book with your readers today. The extract I have chosen is from the chapter entitled 'Be More Lizzy'. 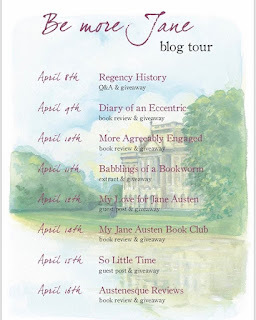 Elizabeth Bennet has always been a huge inspiration for me, not to mention my blog persona as well. I find her such an admirable character. Elizabeth “Lizzy” Bennet is one of the most well known, admired, and popular of Jane Austen’s heroines. 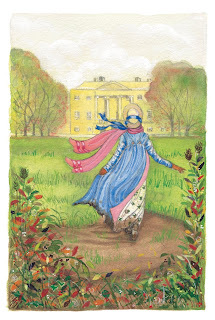 Witty, independent, intelligent, loyal, and a loving daughter and sister, she is perhaps the character most closely linked in the reader’s mind to Jane Austen herself. Since my first introduction to Lizzy, when I was just 16, she has been my inspiration. She has been my blog persona for a number of years and, from her, I have picked up invaluable tips on how to be more of a “Lizzy” in my own life. Life can be tough, so try to make it fun and enjoyable more of the time. Lizzy herself declares, “follies and nonsense, whims and inconsistencies do divert me, I own, and I laugh at them whenever I can” and we should do the same. Lizzy always searches for the funny side to any situation, which is a sensible approach to life, for laughing is proven to be good for us. In today’s challenging world, where we are faced with negativity on a daily basis, it is essential to find joy in as much as we can, to keep us smiling. These are Lizzy’s defiant words during her clash with Lady Catherine de Bourgh, after rumors reach her ladyship of an engagement between Lizzy and her nephew, Mr Darcy. Elizabeth is a wonderful example of someone who knows her own mind and will not be persuaded to do anything she does not believe in. She is even strong enough to stand up to Lady Catherine, a formidable character, of far superior rank in society—no mean feat! Lizzy is someone who will always fight her own corner but is not afraid to support others when needed. She shows real courage and commendable strength of character, particularly for a woman in the Regency era. We can follow in her footsteps, be true to what we know is right, and stand up for our beliefs. These are the two principal lessons to be learned from our inspirational heroine, and they are two that have particularly helped me. "six inches deep in mud"! But it also seems to me that occasionally walking through a muddy field, as Lizzy famously does, might not be such a bad idea when seeking to impress! And perhaps she knows a trick or two when, out of curiosity, she unexpectedly goes visiting a rich man’s house and estate and successfully wins his love (and his fortune!). Seek out the fun in life. Don’t worry about getting a bit of mud on your shoes! This is just one of many topics I touch on in the book, and I have also had a little extra fun along the way, by writing 'vignettes' as some of Austen's most beloved, often comic, characters - who mistakenly believe they have their own sensible advice to share! 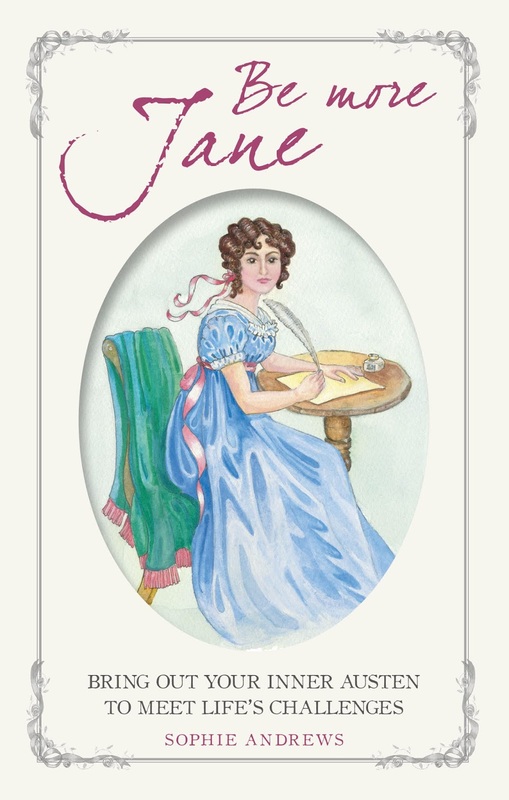 I do hope you all enjoy my new book, 'Be More Jane'. And thank you again for letting me stop by. 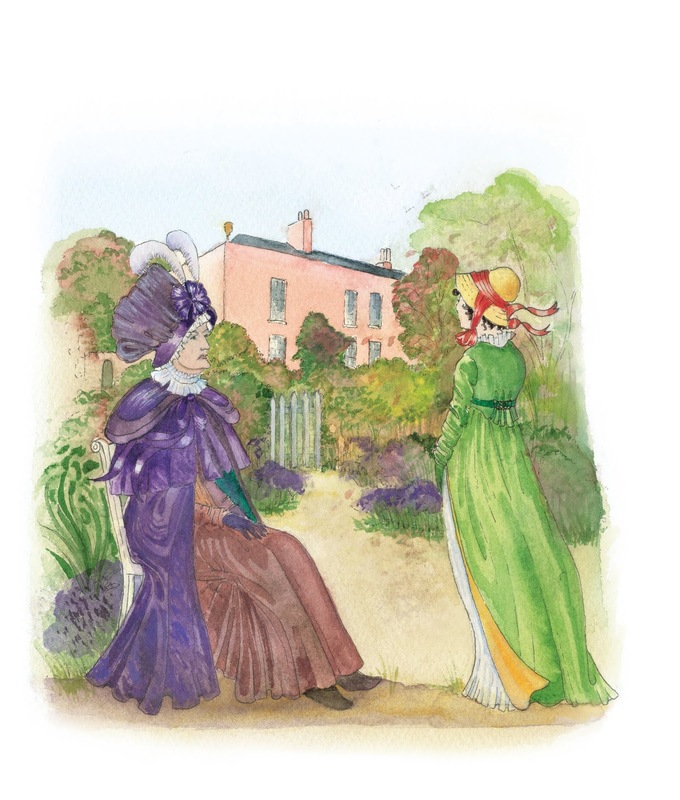 Sophie Andrews is a founder member of the Jane Austen Pineapple Appreciation Society, and organises events such as picnics, balls and house parties for her fellow Austenites. Sophie started her blog, Laughing with Lizzie, in 2012, aged 16, after studying Pride and Prejudice at school. She has been attending Austen-themed events since then, and was featured in the BBC documentary “My Friend Jane” which focused on the fun and friendship she has found with her fellow Janeites. She lives in Berkshire and has over 100 different editions of Pride and Prejudice on her bookshelves. Be More Jane is available to buy now! CICO books are very kindly giving away a copy of the book at each of the blog stops (there's a list below). The giveaway is open to readers in the US, Canada and Europe. To enter, just leave a comment on this blog post by the end of the day on Friday 19 April. You can leave contact details here, such as a twitter name or email address to be notified if you are the winner, but if you'd rather not publish this info, then follow comments on the post, and I will pop in a comment once the winner's name is selected. Thank you so much to CICO books and to Sophie Andrews for visiting Babblings of a Bookworm with this beautiful book! This is delightful! And what beautiful artwork. Congrats, Sophie and Jane Odiwe, on this lovely looking book. Thank you. Lizzie has always been such an inspiration to me, hence becoming my blog persona for a long time. Good luck! I caught myself one day thinking I sounded like Mrs. Bennet. It was such a shock that I immediately tried to mend my ways. In looking back over my life [you do that at a certain age] I saw my actions and behavior were much in line with Lydia. Dang! I think Austen is a most excellent character study and we can find a bit of Austen's characters with each of us. I would love a copy and that is a most beautiful cover. Congratulations on the launch of this and I wish you much success. To Jane Odiwe... fabulous work. I think a book of your art work with Austen quotes would be just the thing. You could showcase all the classics and... and... there I go. Oh well. Sorry. Not sorry. I would still like something like that. Think about it. The artwork shown is absolutely lovely. Whenever I see something of Jane's, I immediately feel serenity. She has a gift. Best wishes to you, Sophie, for a successful launch. This is an awesome project. She is very talented, I agree. They are so classic and beautiful. and thank you! Absolutely delightful! And I'm so impressed Sophie created her blog not only at 16 but after school study of P&P! That usually kills any interest in a book !! Thank you. I don't know … it just completely caught something in my and I was hooked from then, no going back! I never saw a chance to write a book coming though! hehehe thank you. I have enjoyed doing the little sum ups at the end of each chapter! This book is absolutely beautiful. I would love to win a copy.